We’re rounding up some of our best ideas for keeping your flower costs down while not having to sacrifice on serious style. From adding in bunches of vibrantly hued fruit to using found props to add interest, this list will give you that sigh of floral relief you just might need. First and foremost, come to your floral meeting with an open mind. You might be tempted to request specific flowers you’ve been lusting over for years but without knowing that those pretty little petals may be expensive or out-of-season. So describe the color you are going for or the overall look you are trying to achieve. 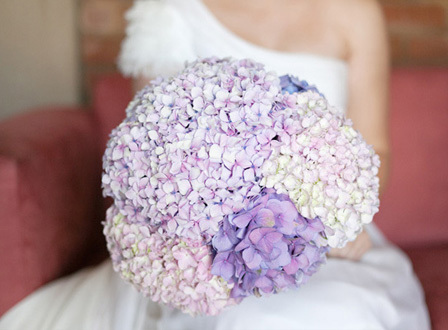 Do you like big, lush blooms or small, delicate flowers? Let your florist know what your style is, and let them work their magic at the market to find less expensive options that still give the same vibe. We are all for making your decor go the extra mile, so decorating your ceremony location with florals that can then serve double duty during cocktail hour and the reception is right up our alley. Ask your florist, coordinator or even your sweet as can be bridesmaids to move flowers used during the ceremony to the reception to decorate cocktail tables, the guest book, the cake table and more! A cluster of flowers in one color is sure to make a statement. And that doesn’t mean it has to be a cluster of orchids — a cluster of carnations or mums will do just fine! Line them up on your banquet table in a row, or use different heights to add dimension. Working with one color palette makes things beautifully cohesive. Fluff up your floral design with some inexpensive but statement-worthy greenery, which serves as a great filler and is less expensive than flowers. Instead of filling an entire vase with peonies or roses, incorporate some pretty ferns or eucalyptus with one or two blossoms, so you can get the beauty of those blooms on a budget. Candles can make a big, romantic impact. Nothing beats the ambiance of a room full of twinkling candlelight. Nothing. Consider using lots of candles on your table with either bud vases or even loose blossoms around the bases. Big impact, without big costs.